As you get older, your family starts to play a more pivotal role in your life and the parent child relationship becomes a role reversal, with the children often looking after a parent. 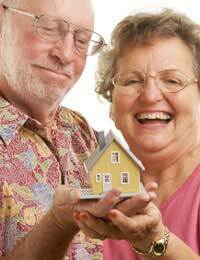 Faye and Jack had always owned their own property and enjoyed their independence. Things were starting to become increasingly difficult for them though. Faye had retired five years ago and was 65, but Jack had been retired for around 10 years and was a bit older at 70. Jack suffered a bad back and was finding things such as the stairs in their home a challenge. “Our situation was not urgent, we knew we would be ok in our current home for at least another five years, but we did not want to reach the point where we were depending heavily on others. We had a good relationship with our daughter and knew that she would be there for us if we needed her,” explains Faye. “We had scattered the idea around a few times about one day possibly moving in but it had always been dismissed because their house was not big enough to accommodate use,” explains Faye. Faye’s daughter lived in a three-bedroom detached property, while there would have been room for her parents it would not have been an easy living situation as her daughter still needed some alone time with her husband. “One day our daughter came to us and said her and her husband may have found a good way for us all to live under the same roof. They had been looking at some new developments that were being built near to where we all lived. She suggested that we could both sell our homes and club together to buy a larger property. “We would have our own bedroom and bathroom along with a dining/living room. The only amenities we would share would be the kitchen,” explains Faye. They also had the option to take either the downstairs or the upstairs if they wanted. “I thought this was a great idea in theory and would provide us with a comfortable home for the rest of our lives,” says Jack. The new properties they had their eyes on were not cheap and they would need to sell both of their homes in order to buy one, so they needed to discuss their finances. Faye and Jack did not have any issues with combining their money with their daughter’s and son in laws. They had always planned that when they died they would leave their home and belongings to their daughter as she was the only child. “We thought it made sense to invest our money into the property, our daughter would be reaping the rewards when we were no longer alive, but it had always been our decision to leave them our house anyway, at least this way we were able to benefit and save on any potential homecare costs,” says Faye. Money is the main cause of family feuds for a lot of people, so if you do decide to live with family in retirement it is worthwhile arranging who will pay for what beforehand. If you are moving in with family but unable to offer any money towards your care, maybe you could help in other ways such as doing odd jobs around the house or coming to some other arrangement. Living with your family in retirement can be one of the most enjoyable ways to spend your old age and cut down on costs, but it can also be challenging, so it is worth establishing boundaries before you move in.